The theme of this year’s World Food Day is focused on bringing access to nourishing, healthy, and safe food to the world’s population—in essence, good, clean, and fair food for all. There’s a reason that these three words resonate so deeply in the Slow Food community. They capture in the simplest terms a set of values centered around human health, ecological stewardship, and social equity. They rally a movement of individuals and communities spread out across over 160 nations to act thoughtfully and gather intentionally around the table. The United Nations’ Sustainable Development Goals call for a transformation of the rural economy, encouraging the adoption of sustainable agriculture methods to strengthen the resilience of the world’s smallholder farmers. It’s a lofty and ambitious charge that puts forth a vision for a bright food future, but the question remains—what steps do we take to get there? The challenges—and thus, opportunities—of today’s global food economy are not isolated to the world’s rural communities, but belong to us collectively. Together, we have the opportunity to create, reimagine, and celebrate a new food culture—one that marries tradition with innovation, community with individuality, and mindfulness with joyful play. In Slow Food lexicon, we use the terms producer and co-producers. The producers encompass our farmers, fisherfolk, brewers, gardeners, cheesemakers, etc.—the artisans who grow the food that fuels us. A co-producer is a consumer who values and partakes in the creation of a good, clean, and fair food economy, actively supporting the world’s food producers. As co-producers, we are all protagonists in our shared food story. Each of us has the opportunity to vote with our fork, eat consciously with a sense of joy, and transform the kitchen table. Here in New York City, all of the work we do directly supports our good, clean, and fair food initiatives including our seasonal urban farm in East New York and educational nutrition programs for young students throughout the city. We strive to support local, eat in season, and minimize waste through all of our community endeavors. Will you join us as co-producers in this food revolution? 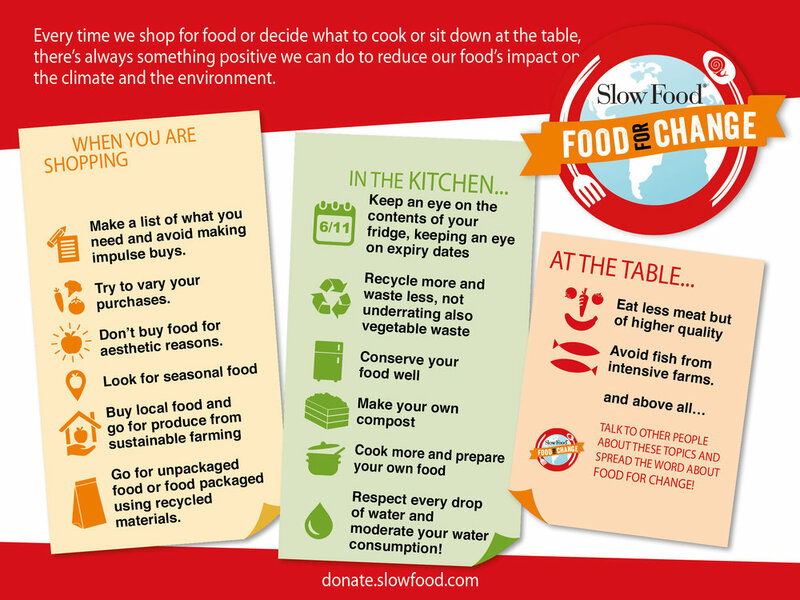 Take the Food for Change challenge and pledge to work together towards a delicious solution to climate change! Happy World Food Day from our table to yours! Here at Slow Food NYC, we offer a variety of programs to allow people to experience what we mean by Good, Clean, and Fair Food for All. Through Slow U we offer annual and other special fun and educational events, like Duck Off! An all local duck cook-off, and the SFNYC Food Almanac, our annual food and farm policy review. Snail of Approval provides a chance for restauranteurs, food and beverage artisans, markets, and caterers to also get involved and align their values with Slow Food's. Ultimately, all of the time and energy put into these events goes to fuel Urban Harvest, including our program of hands-on experience at our educational urban farm that provides young people in East New York a bit of time getting their hands dirty and learning about the joy of food directly from farm to plate. Our tuition free program operates through the summer months, allowing students to participate in summer programs and taste the bounty of food grown in their very own neighborhood. Ujima is at the very heart of SFNYC, but it takes many hands and quite a bit of time and money to prep the land and programming for excited young students in the summer. With the help of our farmers and an education and outreach team, we'll be starting our 8th year of good food education at Ujima this summer. We hope to continue this program many years into the future, but we can't do it without the support of all of you. In order to continue the work that we've done through Urban Harvest, we ask that you donate any dollar amount to our Good Food Education in East New York campaign. Slow Food NYC is looking for a few great men and women! We're wrapping up another great year and are now seeking passionate, talented, energetic Slow Food supporters who will join our Board to serve a three-year term and help us continue our work toward a good, clean and fair food system in New York City. Eligible nominees must be current members of Slow Food USA. If you are interested in running for a board slot, nominations are due by 6:00 pm on Sunday, December 4. You may make multiple nominations, and you may self-nominate. In each case, please provide a few sentences in support of the candidate's qualifications. Our Elections Committee will review your nominations and select a slate of nominees. Voting by the current membership is scheduled to take place in early January 2017. If you have any questions, please contact the Elections Committee at info@slowfoodnyc.org.